The perfect pick-me-up! Healthy, sweet, juicy and easy to peel. 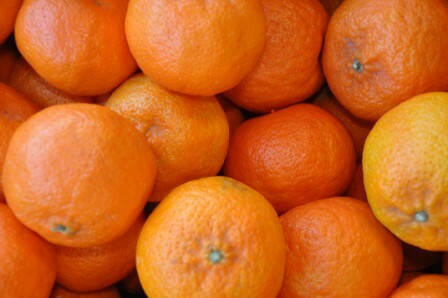 Satsuma Mandarins are soft, yet heavy with sweet juices. 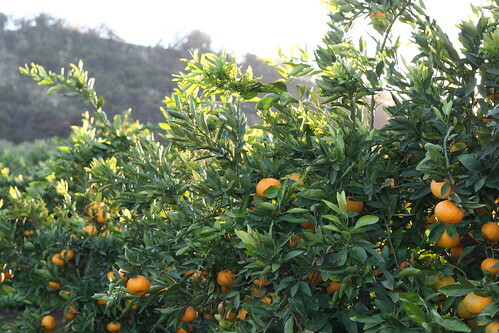 The longer the fruit stays on the tree, the higher their sugar content - or brix, so earlier in the season, they can be a little more firm and tart. Once your fruit is to your desired ripeness, place your fruit in the refrigerator to extend their shelf life. Satsuma Mandarins are usually eaten out of hand, but make a great addition to salads and savory dishes.They are often paired with bold-flavored foods, such as fennel and blue cheese because their sweetness provides a complementary effect. 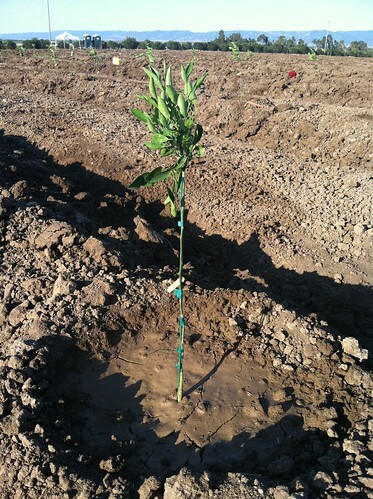 We are excited about a new Satsuma Mandarin orchard we planted earlier this year. Two years ago, we ordered the trees, and this summer they showed up neatly organized into bins that were delivered from the nursery. Now the trees have been tucked into their homes that were precisely located with the help of a GPS and a surveying crew. The new trees look good in the field, but they are so tiny! 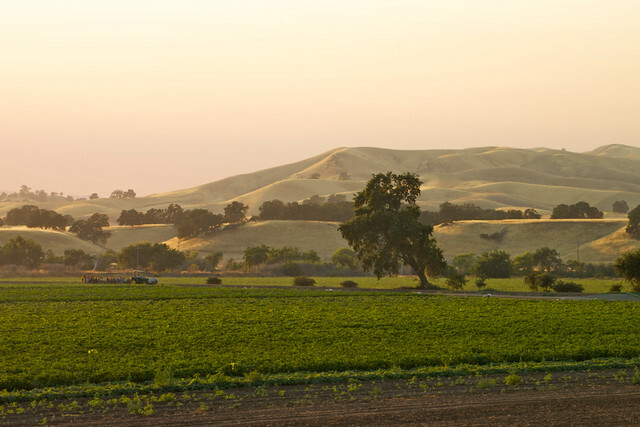 From the distance, the trees appear as little, green toothpicks neatly organized in a brown field that rolls up and down with the contour of the gently sloping hills. The thought of a mature orchard seems so far away, but we know that slowly and steadily those little trees will make great use of the soil, sun, water and love that we will provide them. Juice Them! Drink your juice straight from the juicer or add it to your favorite tea or cocktail. Fresh citrus juice is also a great ingredient for sauces, dressings and vinaigrette. Freeze Them! Separate the segments then freeze them - perfect for smoothies! Use the juice to make sorbet, granita or a frozen orange souffle. Bake Them! Use Satsumas in your next cake, muffin, biscotti, scone or cheesecake. Preserve Them! 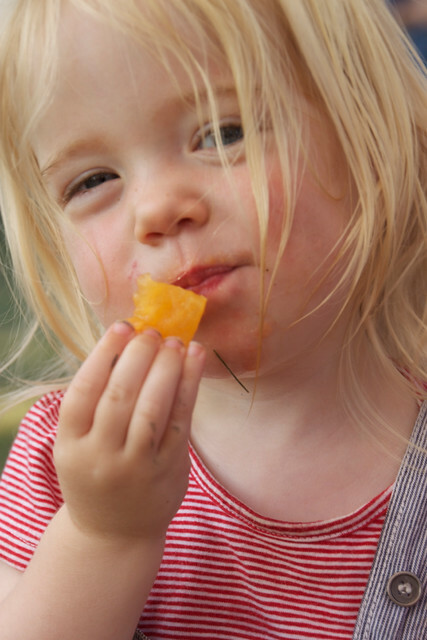 Satsumas are some of the best citrus fruits to preserve. 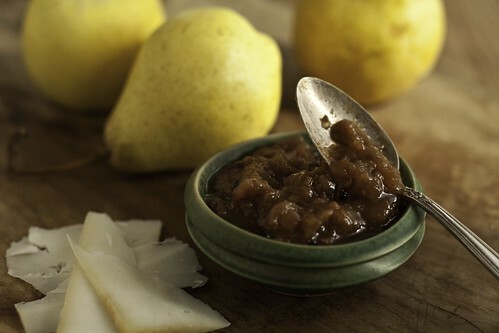 Turn your fresh fruit into a sweet marmalade, jam, jelly or syrup to enjoy long after Satsuma season is over. Peel Them! Candy your peels, or dry them and add chunks of peel to braises or sauces. You can grind the dried peels and mix with your favorite herbs and spices to create a savory-yet-sweet spice rub to enhance just about anything. Eat Them! Add fresh Satsuma segments to salads, garnish seafood dishes, make a compote or salsa, include in side dishes such as shaved fennel, fruit salad or cous cous. Decorate With Them! 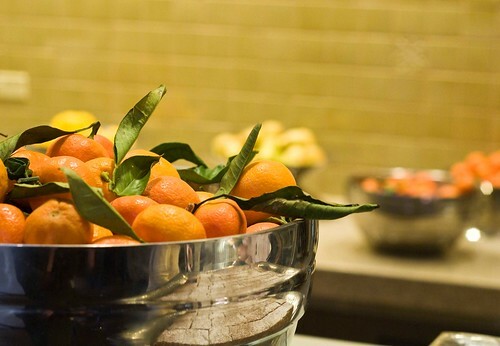 Satsumas add a hint of color to any centerpiece, wreath or garland. 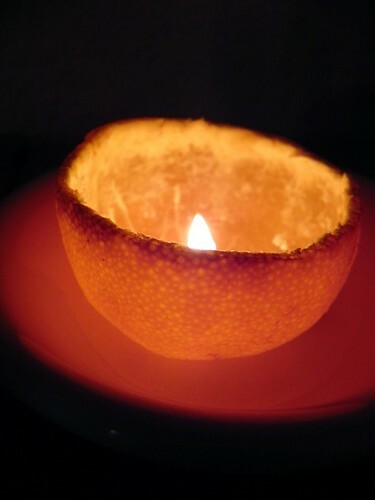 Craft your peel into a simple, lovely candle that uses the pith as a wick. 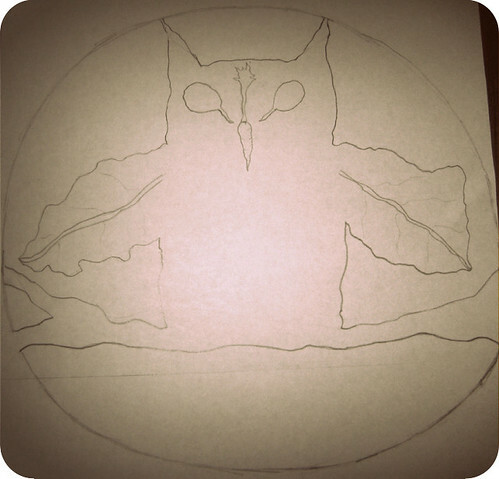 As you hold your perfectly-picked pumpkin and carefully consider what creative carvings will adorn your Cucurbitaceae this year – we'd like to suggest this Farm Fresh To You inspired Pumpkin Carving Template sketched by Julie L., one of our CSA members. Thanks Julie! 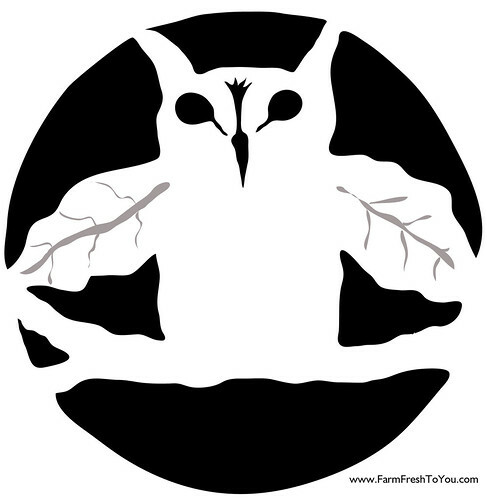 With radish eyes, a carrot nose and chard wings the wise owl knows that veggies shouldn't be scary! 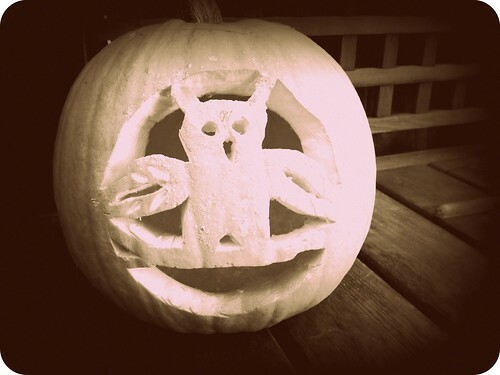 Whether you give our autumn owl a try or set your carving skills to another design, we'd love to see your flickering, candle-lit jack-o-lanterns so be sure to share them by leaving a comment (and a photo link) below or by sharing some of your spooky season spirit with us on our Facebook wall. 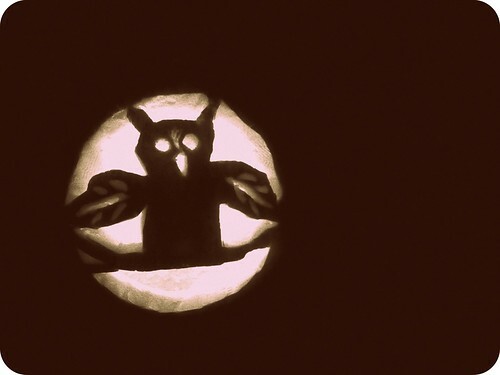 Click here for a printable PDF of our pumpkin-carving template. 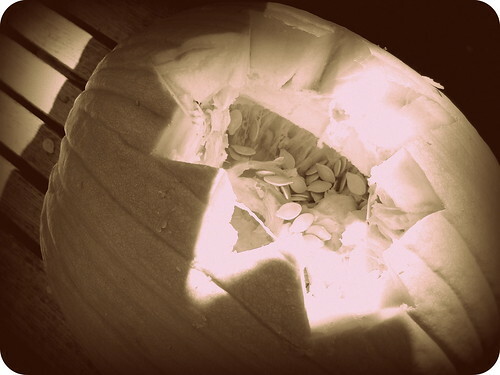 Happy Carving - Wishing everyone a happy and safe Halloween! 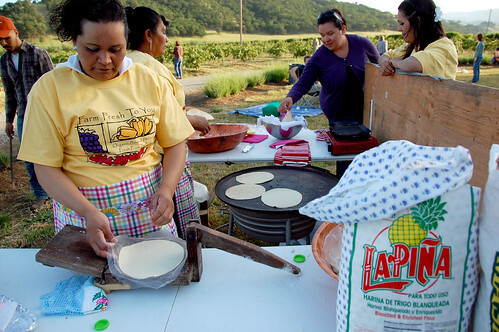 In a recent documentary, Capital Public Radio explored "What's for Lunch? The Move to Improve School Nutrition." and featured a program very important to us, Harvest of the Month (HOTM). 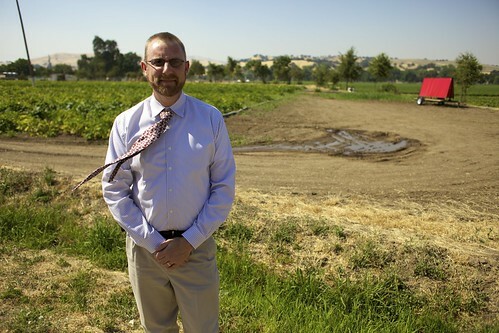 As part of this program, our farm will provide fresh, organic fruits and vegetables to school districts in Yolo County. First Harvest of the Month: Sweet Peppers! 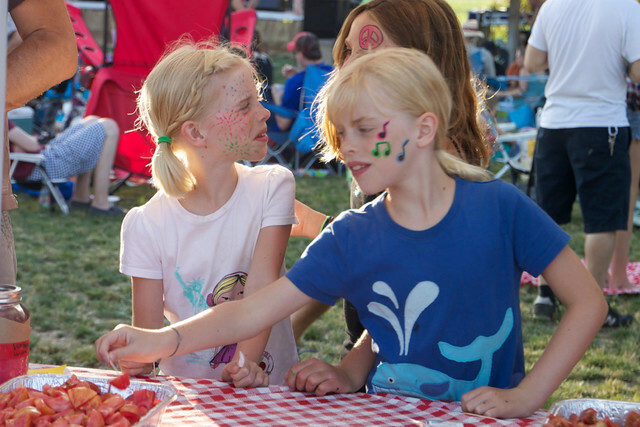 HOTM is a program that connects to core curricular areas and provides educators with materials and resources to motivate students to make healthy choices through hands-on experience with fruits and vegetables. 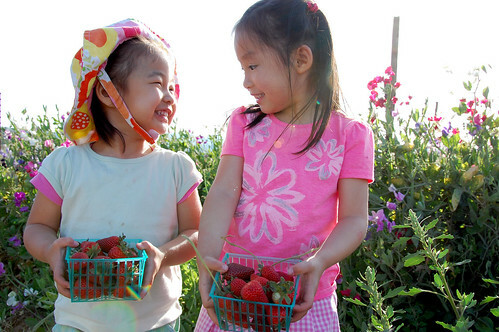 Nutrition fact sheets will be made available to approximately 16,000 elementary and preschool students in Yolo County. 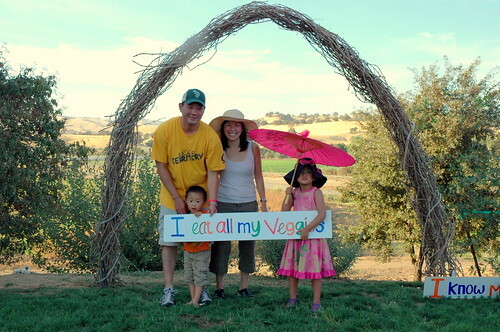 We are so proud to be a part of Harvest of the Month and aim for this to be a model for healthy eating in our schools. ﻿﻿Harvest of the Month allows students to learn about a new fruit or vegetable each month, starting in October with sweet peppers. 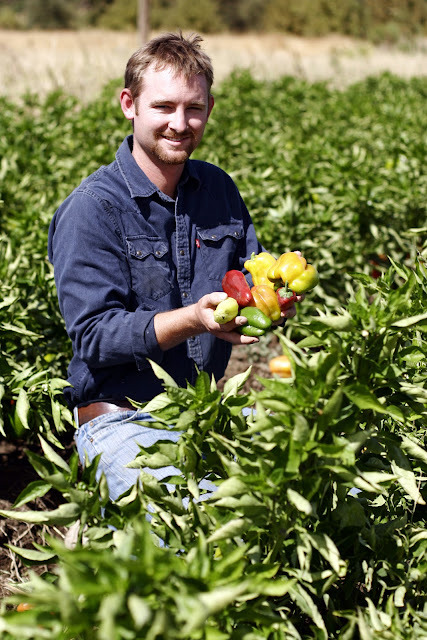 Sweet peppers will be part of salads, pizzas and other dishes in Yolo County schools. 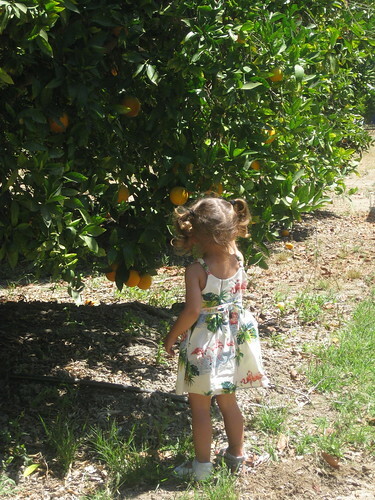 In the following months students will explore these items: November: persimmons, December: kale, January: citrus, February: broccoli, March: carrots, April: asparagus, May: strawberries. 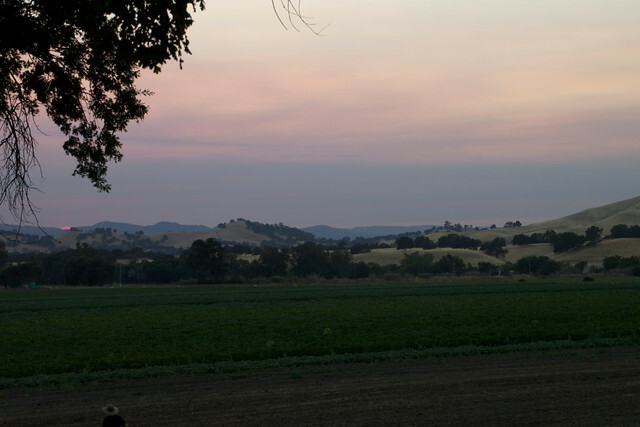 Our farm will harvest our produce and partner with other Yolo County farms to meet the program’s produce needs. In addition, we will work with the county to disseminate nutritional education information to students about each month’s harvest item. Each month, Yolo County student nutrition directors will buy these fresh produce items and include them in their hot dishes and salad bars. Students will receive monthly nutrition fact sheets about each Harvest of the Month produce item. 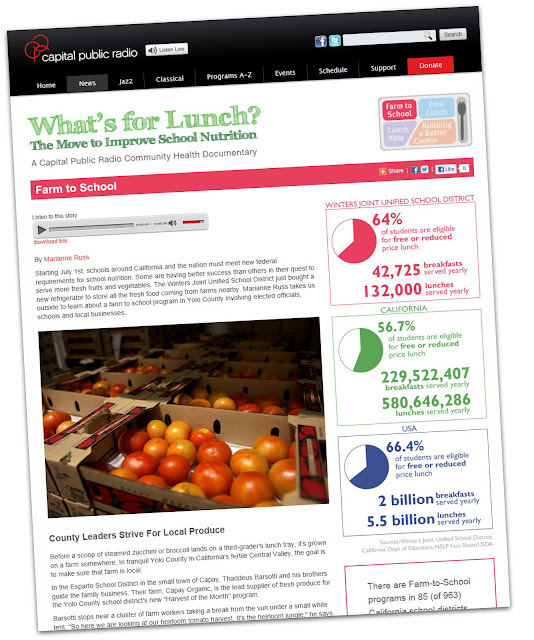 To read the Farm To School article and listen to the Capital Radio documentary, visit http://www.capradio.org/lunch/farm-to-school. For more information on Harvest of the Month, visit www.harvestofthemonth.com and www.harvesthubyolo.org/farm-to-school. 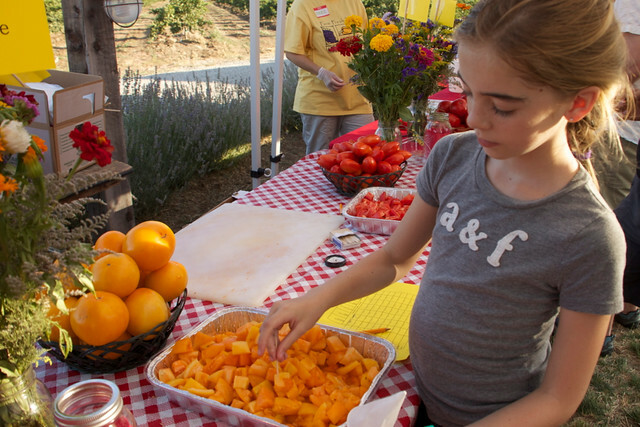 The Harvest of the Month launch coincides with National Farm to School month. 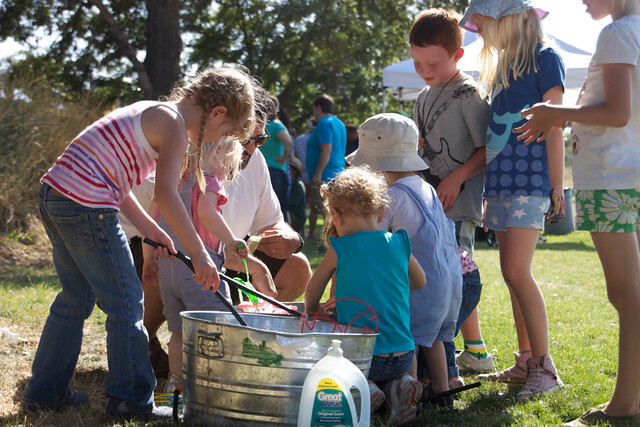 Visit www.farmtoschoolmonth.org to find additional resources and materials. In this small handful of organic heirloom-tomato seeds, I hold both a bit of history and of future promise. I am holding a piece of the plants I once nurtured and the ones I will tend next season. The seeds came from the fruit of one season's work and will grow into the fruit shared from another. As an organic farmer, I can't help but be impressed by the natural world around us and this connection to the heirloom crops of years ago. 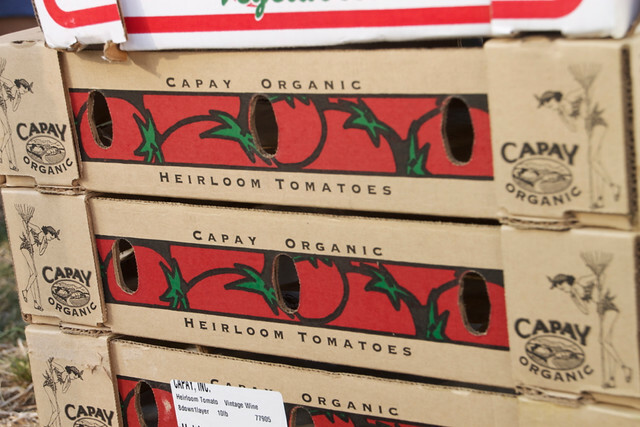 CAN YOU SAVE HEIRLOOM TOMATO SEEDS? Yes! Heirloom tomatoes are self-pollinating and true breeding, allowing you to save seed and grow the same plant again year after year. This attribute is a rarity in the modern world of hybrid varieties bred for disease resistance, uniform size and long shelf life. HOW WELL DO THEY GERMINATE? 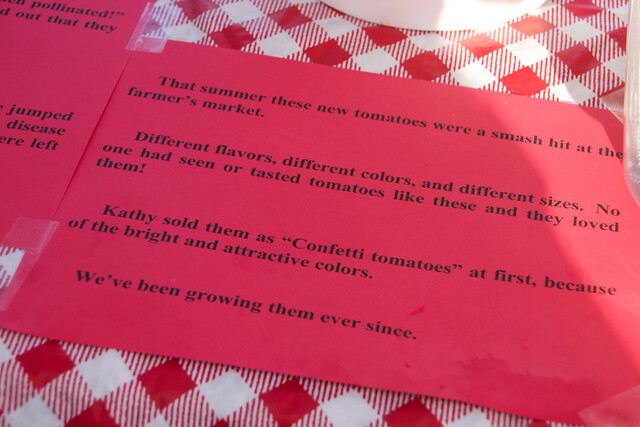 In our first tests, we tried small batches of 20 tomatoes. The resulting germination rate was very good, 97%, with each tomato yielding 150 seeds or so. 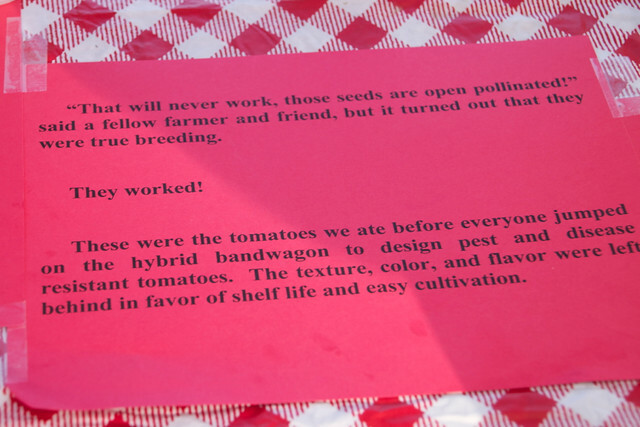 Here's our Vintage Wine tomato seed-saving story and how you can can save tomato seeds for planting another season. Step One: Cut mature, very ripe tomatoes in half and squeeze the seed and juice into a container. 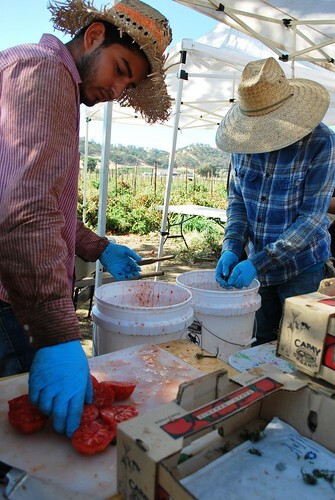 Here we cut 2 pallets of very ripe Vintage Wine tomatoes, about 900 lbs. of fruit, into large buckets. Step Two: Let the seed and soup juice sit for a few days. 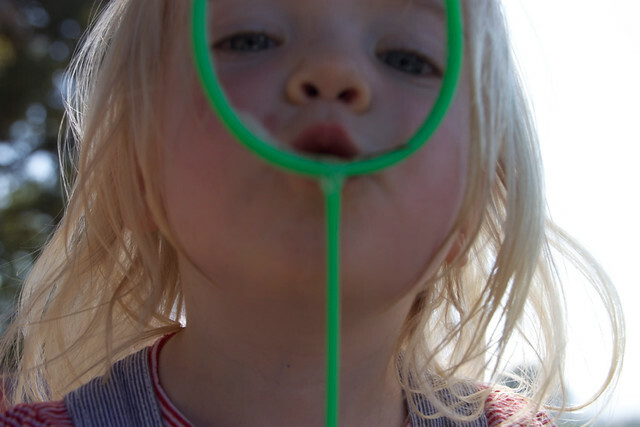 Your container will come to life and bubble with yeasts and other microbes at work during the fermentation process. 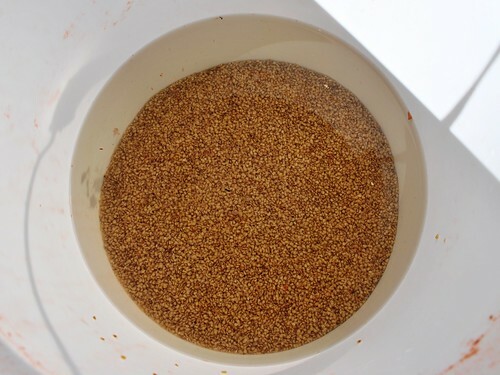 Fermentation is good - it kills disease causing bacteria and harmful fungi, as well as digests the gelatinous, anti-germination coating that surrounds each seed. 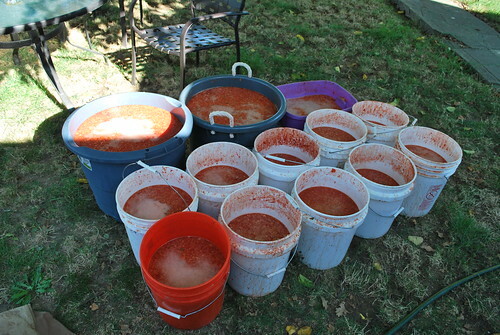 Pictured above is approximately 70 gallons of soup! 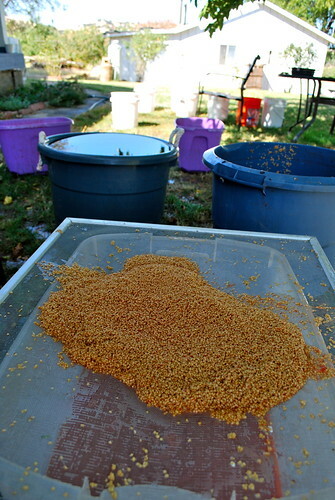 Step Three: Thoroughly rinse the seed clean, and let it dry very well. Keep the seed dry while in storage. 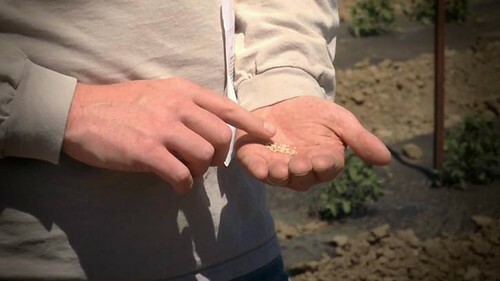 Here we have a pound and a half of seed, which is enough to plant 20 or 30 acres of tomato plants! Step Four: Plant the seeds the following spring! If you select the year’s best fruits and grow their seeds next year, your plant population will be more strongly adapted to your area. Progress with each repetition! 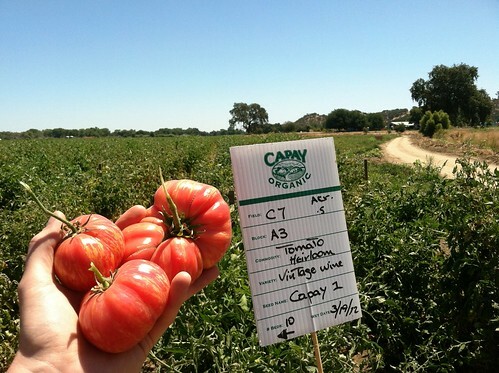 See seed name listed as “Capay 1.” These are the seeds we saved, now all grown up. They were made out of Capay’s air, soil and water and have gone another season in those same elements. 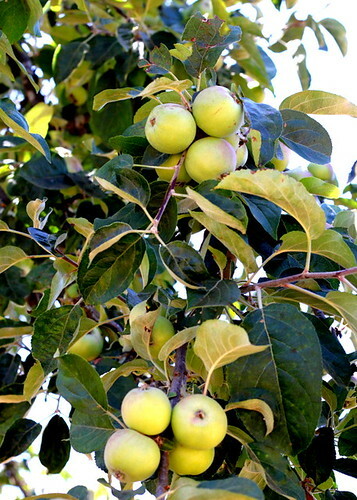 Every season produces something unique, unavailable at any other time of the year, and in summer in our area, one of those is the Gravenstein apple. The Gravenstein is an apple so notable for its flavor that it has been declared to be a heritage food by Slow Food USA, but unfortunately, one in danger of disappearing. 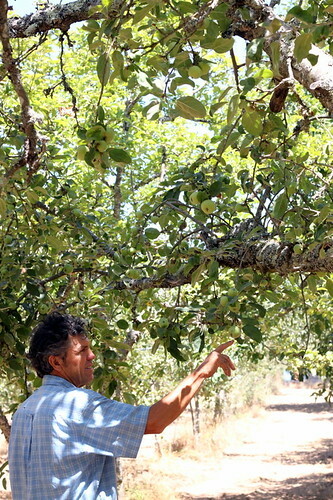 The largest United States planting of the Gravenstein is around the town of Sebastopol, but the quantity is much diminished from years past, when the variety dominated the substantial apple production in Sonoma County. Like so many other flavorful fruits and vegetables, the Gravenstein doesn’t hold well in storage, nor does it ship well, and consequently it has been dropped by many large buyers and shippers in favor of sturdier fruits. 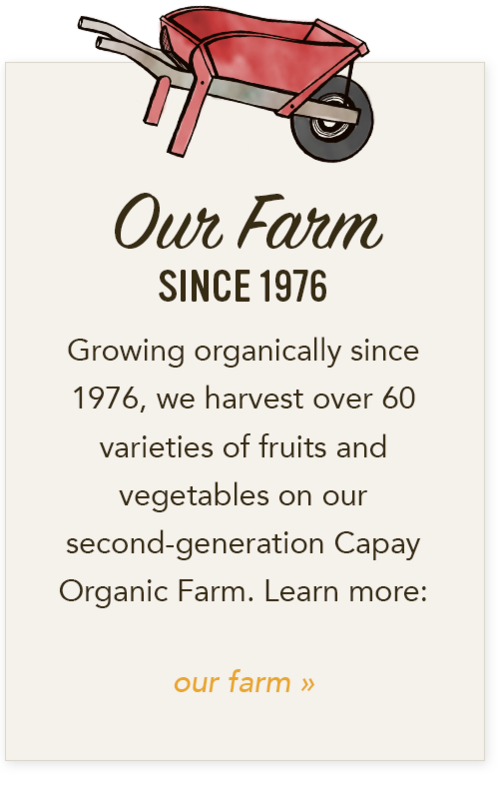 Only in recent years are we discovering the loss to both our agricultural heritage and to our tables of many of the old-fashioned or heirloom fruits and vegetables. Fortunately, dedicated farmers are bringing them back into production with the hope that educated consumers, looking for true taste and flavor, will seek out and buy these special fruits and vegetables. The Gravenstein, thought to have been brought to the area by Russian settlers and fur traders around the first part of the 19th century, certainly fits this description. It has true apple flavor, balanced between slightly sweet and acidic, with a juicy crunch that, to my thinking, is the essence of a good apple. 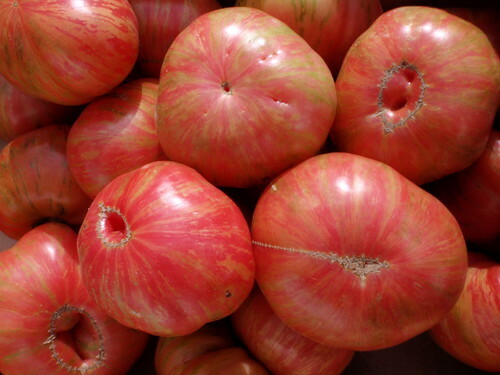 It’s a lovely waxy green, with red striations, or sometimes pure red, and one of its many virtues is that it is equally good eaten out of hand, cooked, or turned into cider. 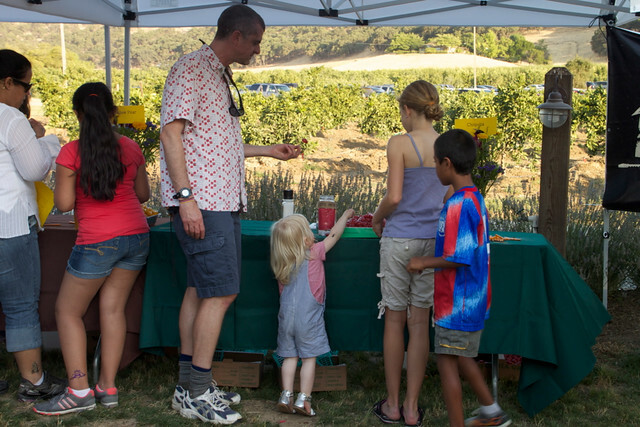 The Gravenstein season is short, essentially July and August, so plan ahead, and make sure you get your fill of one of California’s finest fruits. My son, recently back from Bulgaria, where any fruit with sugar was considered worthy of turning into rakia, is promising to make some with Gravenstein apples this year. His navel orange rakia was a stunning success and we’re looking forward to the apple version. For me, I’ll stick to eating them out of hand or frying them with onions to serve with sausages. Heat the butter over medium heat in a large frying pan. When it foams, add the apples and sauté until the underside is golden, about 7 minutes. Turn, add the onions to the pan and continue to sauté until the second side of the apples is golden and the onions are limp and golden, another, 5 minutes or so. While the apples and onions are cooking, cook the sausages in your favorite fashion. Serve the hot sausages accompanied by the hot apples and onions. Combine all ingredients in a large, heavy metal pan such as a Dutch oven. Bring mixture to a boil. Turn heat to low and cook mixture until all ingredients are soft and blended, about 3 hours. Mix frequently toward the end to prevent burning. To can, place lids with rubber seal into a small sauce pan with about 1 cup of boiling water in it. Soften the lids for about 2 minutes, and turn off heat. Ladle the hot mixture into sterilized pint jars, filling up to ½ - ¼ inch below the top. With a clean cloth, wipe the rim of the jar so that it is clean. Place lid on the rim of the jar. Screw on the ring, fairly tight. Place in a water-bath canner with water covering the jars by about 1-2 inches. Bring water to a boil. Process in a water-bath canner for 10 minutes. Remove jars from water. Let cool. You should hear a popping sound as this occurs. Prior to putting away the chutney, check each seal by pressing down on the lid. It should not give. Label with name of product and date made. 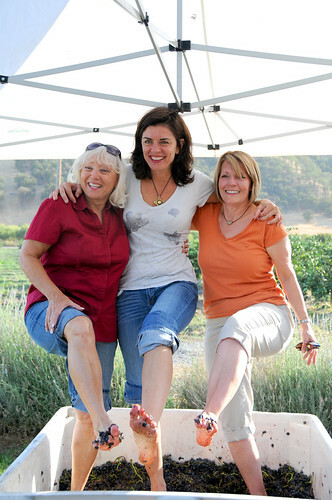 Georgeanne Brennan is an award-winning cookbook author, journalist, and food policy consultant with a distinguished culinary and business career spanning several decades. 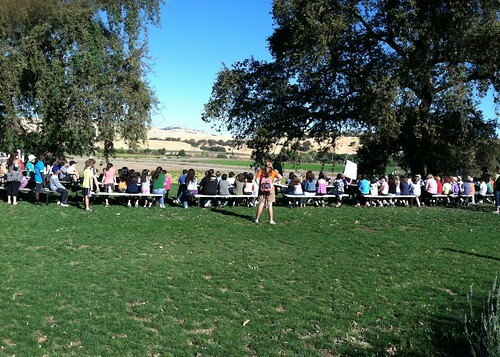 As a principal of Evans & Brennan, LLC , she has been working over the past several years piloting professional development with the Davis JUSD, focusing specifically on enhancing the skills and creativity of the nutrition services staff using the 6-5-4 School Lunch Matrix. The author of more than 30 books on cooking and food, and a cooking school owner and teacher, she brings her considerable expertise to Rethinking School Lunch in rural and urban settings. no other apple need be grown." 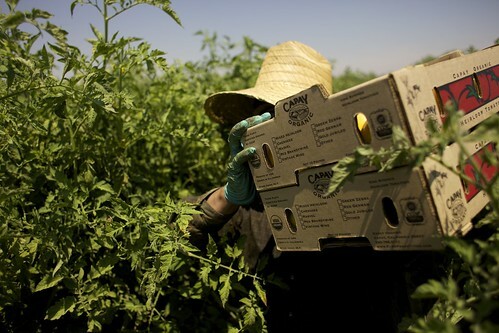 As you peek into your Farm Fresh To You boxes this week, you'll find a special summer treat worth saving and savoring! Gravensteins, highly treasured heirloom apples, are crisp, juicy and delicious, and yet for many reasons, are in danger of becoming extinct. We could not be more proud to partner with farmer John Kolling of Solana Gold Organics, whose extreme dedication and care for the Gravenstein has fulfilled our dream of finding enough of these rare apples that we are finally able to share them with you, our CSA members! 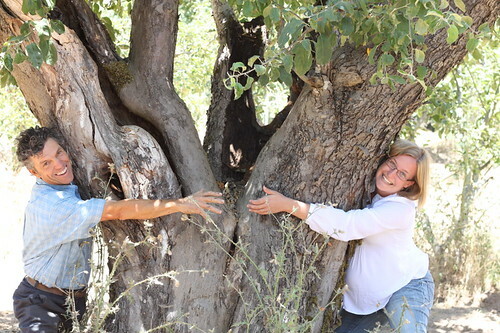 His “Gravs” come from many trees that are over 100 years old, with 30-foot canopies. 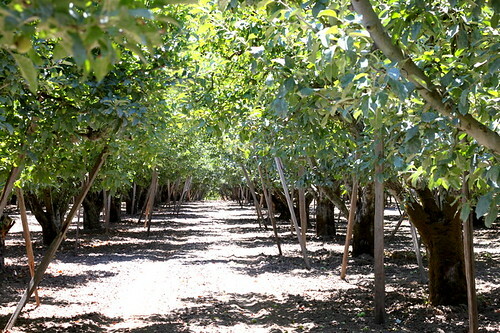 He purposely doesn’t irrigate because forcing the trees to seek moisture builds character, crunch and intensifies aroma and flavor. Gravs need to be hand-picked very carefully as they bruise easily in every color stage. The apple's skin color progresses seven different times over the life of the apple. It starts off a bright lime green then transitions to a medium orange color with faded red over-markings. 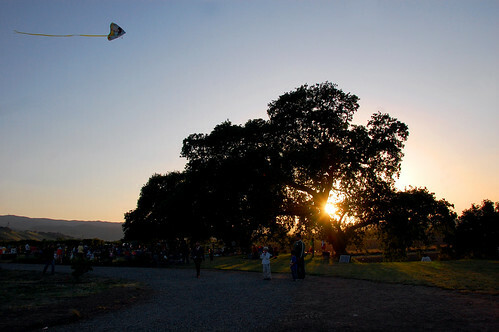 Gravenstein trees have three sets of chromosomes instead of the usual two, making the trees very large compared to other apple trees. Crutches are used to support the weight of their branches. to support the weight of their branches. 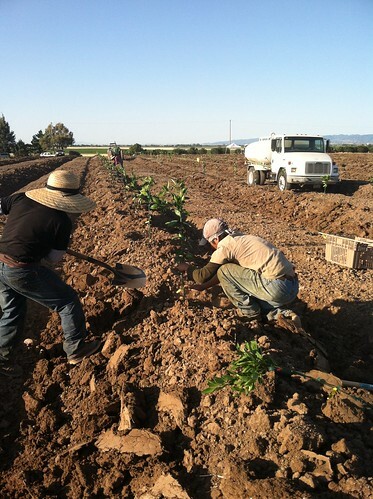 Gravensteins were first planted in California by Russian traders in the early 19th century and for over 100 years, they have found their home in Sebastopol. In addition to Sonoma County, this apple does well in the Annapolis Valley of Nova Scotia. What makes Gravenstein apples so unique? Perfectly balanced flavor - sweet and tart! Versatile fruit - great for cooking and baking. Early bloomers - these apples are some of the first of the season, and are harvested in July and August. 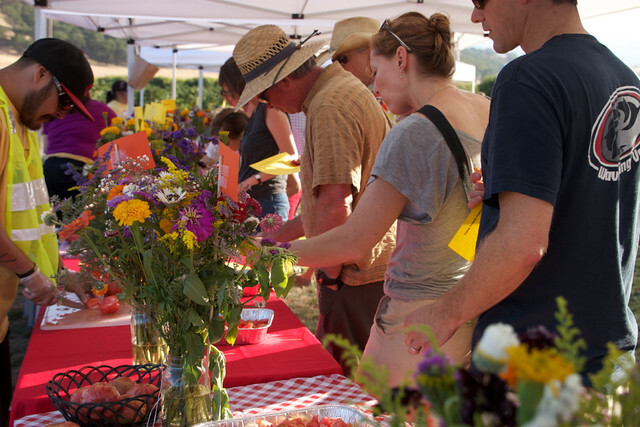 Passionate followers - There is a high demand for the apples and major supportive groups and events such as Slow Food, Apple Blossom Festival, Gravenstein Apple Fair. Tall trees - difficult to reach the apples that are on the tallest parts of the trees. 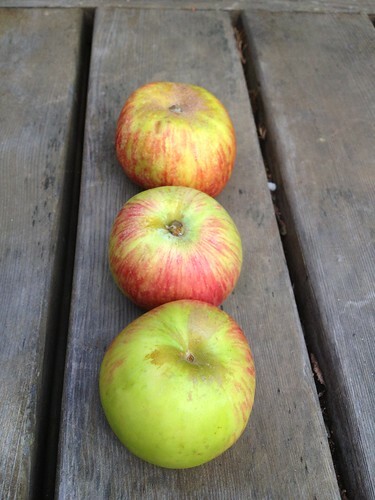 Short, weak stems - causes apples to fall from the tree prematurely. 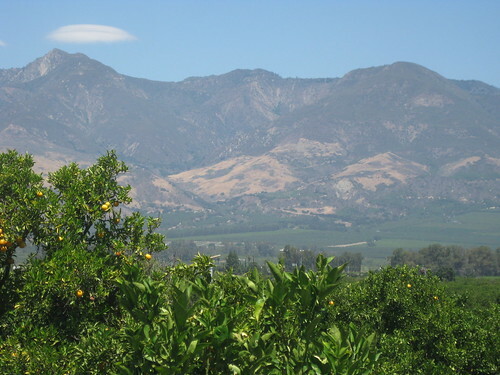 Diminishing farm land - higher demand and higher profit margin for wine grapes or real estate. Uncertain harvest cycles and short shelf-life. 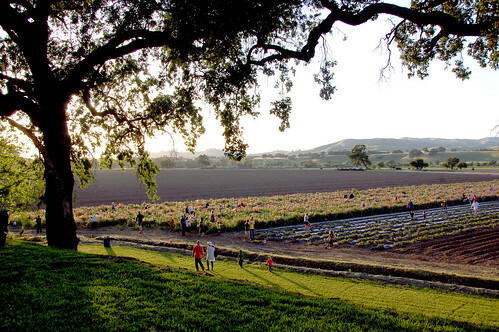 John Kolling takes us out into his orchard. You can tell how much we love his trees too! 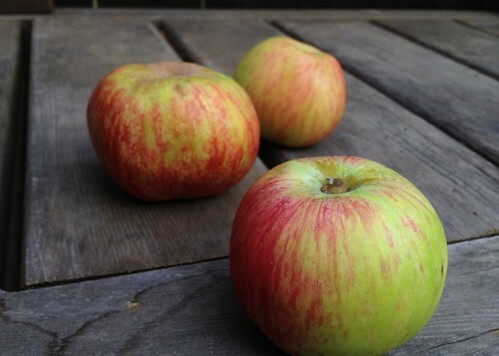 Gravensteins, both sweet and tart, are great for eating raw, making applesauce and cider, and of course, baking in a pie. They are also known to make a delicious vinegar. The apple is crispy, juicy and aromatic. We could not share these apples without the amazing work of John Kolling and his farm, Solana Gold Organics. A big thank you to John for his labor of love! 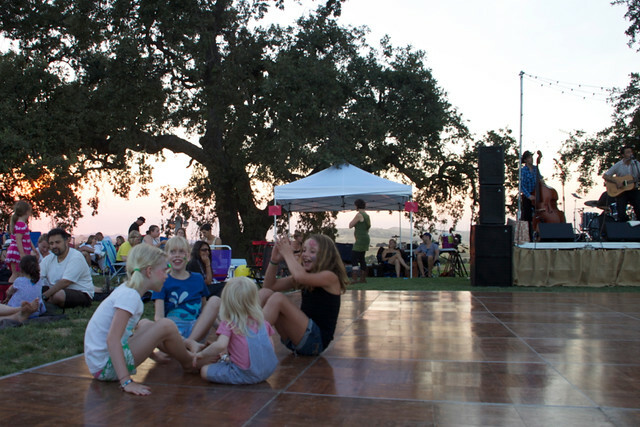 As you'd imagine, we've gathered some great memories from farm events over the years. What you might not know is that it's the stories shared by those who visit, by many of you, that really allow us to experience the event in a whole new way - that make the very best stories. Here's one such story shared with us by Nicola, on her own blog Growing Berries, and graciously reposted here so we could share it with all of you! We have just returned to France, where we are living for a couple of years, after a four week visit to our home in California. When we first arrived back in the United States, for the home visit it seemed like we had so much time stretching ahead of us and I expected we would fill much of it doing some of the touristy things we never got around to whilst living here, like visiting Alcatraz or walking across the Golden Gate Bridge in its 75th anniversary year. The four weeks flew by though and those activities will have to stay on our bucket list as we chose to spend our time staying local, near friends and our favorite swimming pool, with my older daughters attending camps and more sleepovers than we could count! 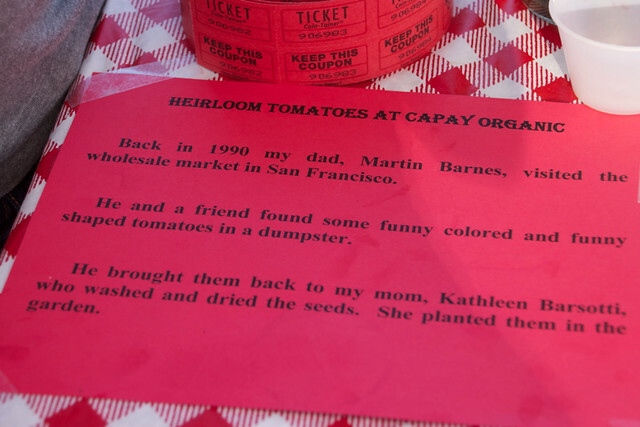 On our final weekend though, we did fulfill a long held desire to attend the Tomato Festival, at Capay Farm. 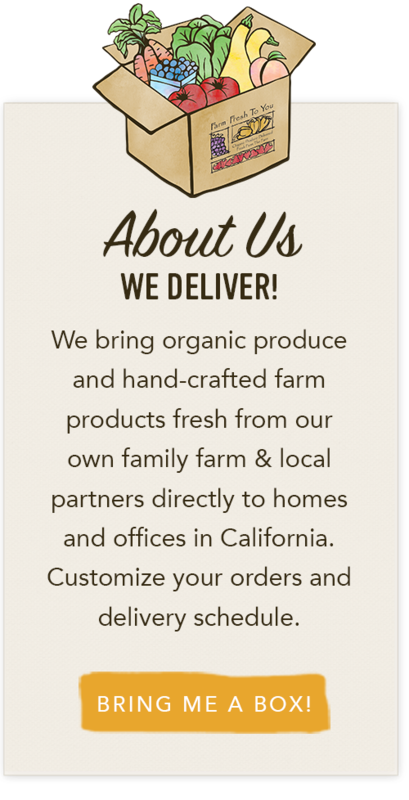 We started getting a Farm Fresh to You box about four years ago and it completely changed the way we ate. I already loved cooking at home, but starting our menu planning with the vegetables we had available rather than the meat seemed to be a much healthier approach and never quite knowing which seasonal vegetables were going to turn up in our box really got the whole family trying new foods on a weekly basis. 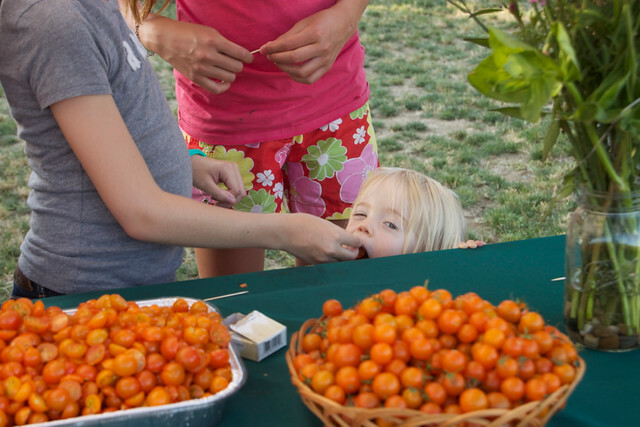 We had attended lots of open days at the farm in every season whilst we lived here, but the heirloom tomato festival in the summer never seemed to fall at a good time for us. This year though we finally made it with our good friends who share our love for the contents of those boxes. 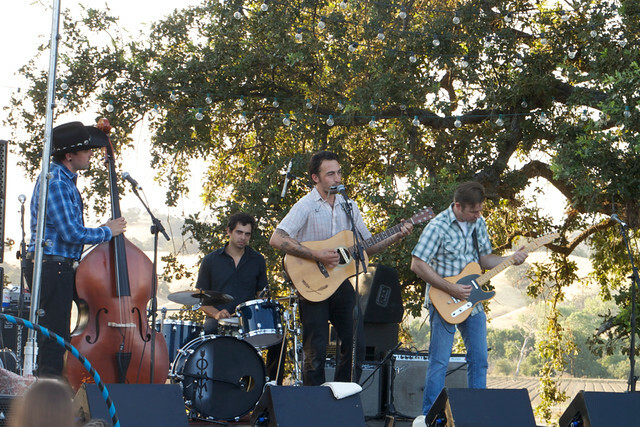 The farm is about an hour and a half's drive north of our home in the East Bay and looked so green and pretty in the perfect weather that blessed the day of the festival. 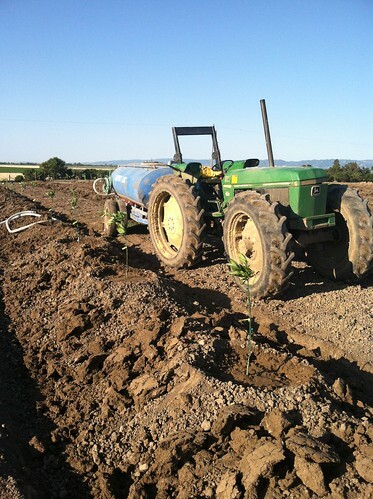 Tractor rides took visitors around the fields, filled at this time of year with summer squash and asparagus. The main event though was the Heirloom Tomato Tasting. Now, although those organic boxes have got my kids eating carrots, pistachios, spinach and even kale, my eldest daughters, India, Georgia and Savannah still maintain that they hate tomatoes and cannot usually be persuaded to eat them. I think they may have been converted though after this weekend. All three girls tried and liked the huge variety of tomatoes on offer. 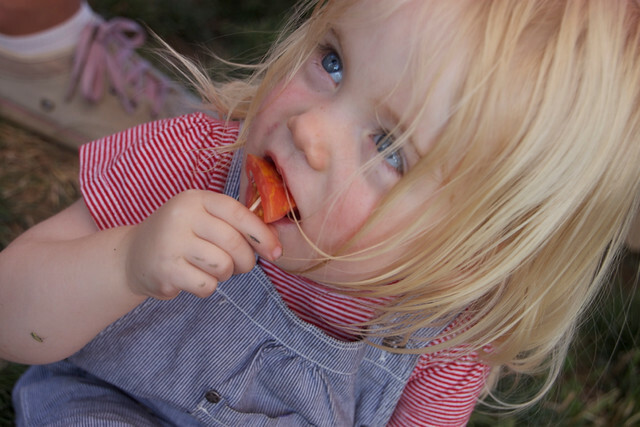 Someone who doesn't need any persuading to eat a tomato though is Florence. 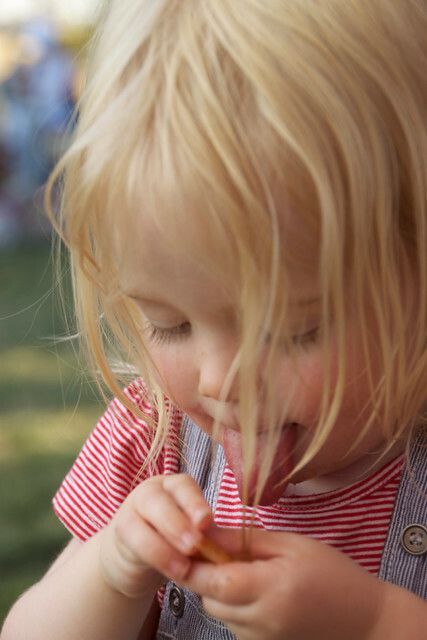 She adores them and she was in tomato tasting heaven here. 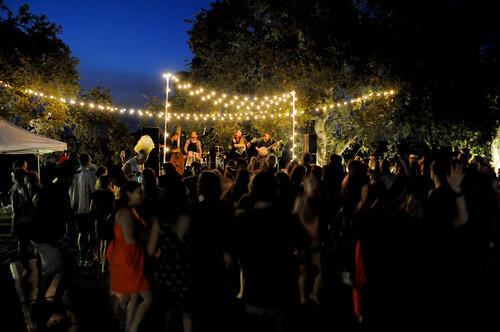 The party continued with live music. Just a few more tomatoes. 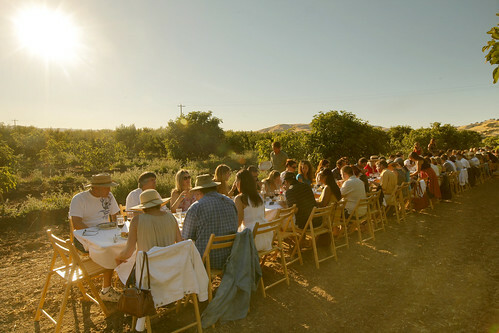 A wonderful day out in the fresh air with good food, great company and more tomatoes than you can eat. Thank you again to Nicola and be sure to check out her blog for more amazing photos and tales of her family's adventures.